Habit: Perennial herb, mat-like, from rhizomes or stolons. Stem: +- branched. Leaf: blade short, flat, narrow, fleshy. Inflorescence: digitate; branches 2--20, spike-like, spikelets sessile, overlapping, in 2 rows along 1 side of axis. 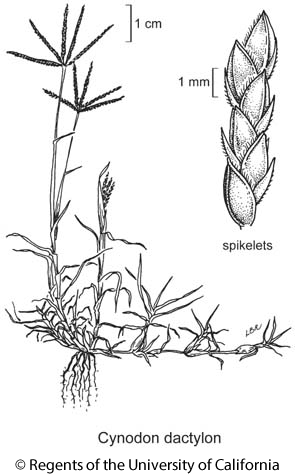 Spikelet: bisexual, strongly compressed; glumes +- equal, 1-veined, awn 0; floret 1(2), upper floret vestigial, breaking above glumes; lemma keeled, 3-veined, awn 0; palea = lemma, 2-veined. Species In Genus: 8--10 species: tropics, warm temperate Eurasia, Africa. Etymology: (Greek: dog tooth, from hard scales on rhizomes) Note: Cynodon transvaalensis Burtt Davy [Cynodon transvalensis, orth. var. ], Cynodon plectostachyus (K. Schum.) Pilg. occasionally reported, not naturalized. Habit: Perennial herb from rhizomes or stolons. Stem: generally erect, 1--4 dm. Leaf: ligule white-hairy; blade < 6 cm, glabrous or upper surface hairy. Inflorescence: branches generally 4--7, 2.5--5 cm. Spikelet: +- 2 mm; glumes +- 1.5 mm, generally +- purple; lemma +- 2 mm, boat-shaped, acute, keel, margins hairy; palea keels glabrous. Chromosomes: 2n=36. Ecology: Disturbed sites; Elevation: < 1600 m. Bioregional Distribution: CA (exc MP); Distribution Outside California: most of United States, Canada, warm temperate, tropics; native to Africa. Toxicity: TOXIC: important pollen source in hay fever; may produce contact dermatitis. Flowering Time: Jun--Aug Note: Cult for lawns, forage. Citation for this treatment: James P. Smith, Jr. 2012, Cynodon dactylon, in Jepson Flora Project (eds.) Jepson eFlora, http://ucjeps.berkeley.edu/eflora/eflora_display.php?tid=21743, accessed on April 24, 2019.